Some of you probably donâ€™t know me but Iâ€™m called Obsession #860, a truss tube Dobonian telelscope. My credentials include an18 inch f/4.5 Galaxy objective mirror with an enhanced coating and a JMI NGC MAX set of digital setting circles. Iâ€™m constructed of maple and red alder plywood. I pal around with a Telrad and 8 X 50 finder scope but really see eye to eye with my best friends, the13 mm and 17 mm Nagler eyepieces. 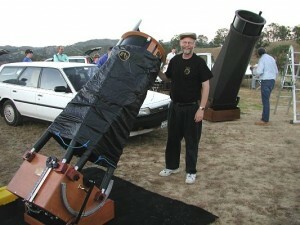 One of our group, 8.8 mm Meade is fine but a bit arrogant, always boasting about making things bigger and better. His cousin, 26 mm Meade Series 4000 is cool. He really takes in the whole scene. But we all make a good set. Iâ€™m almost three years old and I live in San Luis Obispo in a nice cool, dust tight enclosure most of the time. The guy that takes care of me (his name is Tom) takes me out for a monthly viewing of the stars at the Santa Margarita KOA with my friends and occasionally to Red Hill Road off of Hwy 58 where the view is truly spectacular. There are lots of other friendly scopes and owners at these gigs. (a distant relative) at the KOA site convinced Tom that this was to be the next topic of discussion over dinner with Norma. â€œUh dearâ€¦â€. So I appeared on the scene in October 2002. Favorite Deep Sky Object: Without a doubt, M42, the Orion Nebula; makes my truss tubes tremble. There are well over a thousand of us now. And my creator, Dave Kriege, a dentist in Wisconsin has started assembling 12.5â€ and 15â€ models. You can learn more about us HERE. Donâ€™t forget the word â€œtelescopeâ€ in the address. Tom had an embarrassing moment whenâ€¦Oh well. So please come visit Tom and me at the KOA campground. Weâ€™d love to show you around the sky.